Chicago has a multitude of attractions. A sky ledge, museums for all tastes and ages, a big silver bean, beautiful parks and a lake that lines it all. But there is one attraction that trumps them all. It’s our biggest aesthetic asset that draws “oooo’s” and “ahhh’s” from any angle. It’s an attraction that is free to see and priceless upon sight. And that is our Chicago skyline. Many tourists who look at Chicago’s cityscape from the sky or from the Navy Pier ledge see beautiful buildings that vary in shape, size and color. The dramatic and breathtaking beauty of our skyline is so overpowering that not many people stop to think about why those buildings shine in the Chicago sun and glow so brightly in the night. And this is a good thing. The director of a movie wants the audience to forget they are watching the movie and instead feel part of the movie. Our skyline is no different. We are so caught up in its beauty that we almost assume our skyline is organic and self-maintained. But at BOMA/Chicago, we see the big picture. We see a skyline that is comprised of world-class office towers that are managed and maintained by world-class property management teams and affiliate companies who make up the membership of BOMA/Chicago. Through your hard work and with our support, the Chicago skyline shined brighter than ever this year. 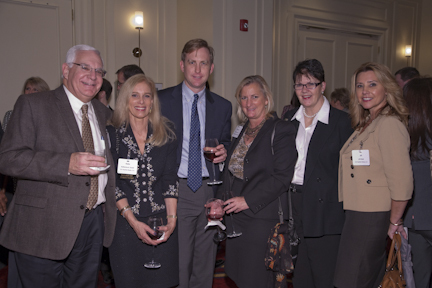 Katie Scott, Managing Director-Executive Vice President at U.S. Equities Realty, with her property management team. Many of your teams joined us at the JW Marriott on November 21 for the 111th Annual Membership Meeting, where our officers delivered a very thorough ‘state of the membership’ address highlighting the membership benefits we provided you with over the last year. In case you missed the Annual Meeting or would like a refresher on how BOMA/Chicago educates, advocates and acts as a resource for all of our members, below is a recap of the night’s key happenings. You can also read our 2013 Annual Report and relive the night by watching live videos of the Annual Meeting and scrolling through the photo album. Michael Cornicelli, BOMA/Chicago Executive Vice President, kicks off the Annual Meeting. 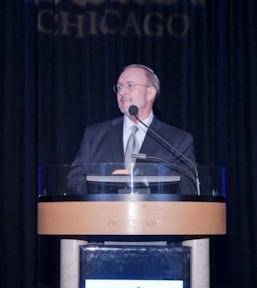 Michael Cornicelli, BOMA/Chicago Executive Vice President, kicked off the night by welcoming guests and thanking our Annual Meeting sponsors – Able Services (Opening Reception sponsor), Corporate Concierge Services (Dinner Service sponsor), Zonatherm Products (Dinner Wine Service sponsor) and Concierge Unlimited International (Champagne and Dessert Service sponsor). Cornicelli also thanked our 2013 Gem Sponsors, Eurest Services and Comcast Business. George Kohl, President of BOMA/Chicago, stepped up to the podium to thank all 22 individuals who served on the 2013 Board of Directors and to recognize the work of the 21 BOMA/Chicago Committees and Sub-Committees. Chuck Wagener, Chair of the Nominating Committee and a member of the Board of Directors, announced the candidates for election as officers and members of the 2014 BOMA/Chicago Board of Directors – including a new Board Member, Derrick Johnson, Vice President of Zeller Realty Group. Kohl paid a special tribute to Bob Six, who served as an officer and director of BOMA/Chicago for nine years. Over these years, Six carved a legacy for himself through his dedication to developing our industry’s future leaders as a faculty member, his leadership in creating BOMA/Chicago’s first economic impact study, his contributions to the BOMA/Chicago Foundation and its scholarship program and the endless hours he dedicated to cutting-edge initiatives, such as traveling to Korea on behalf of BOMA/Chicago and the efforts to launch the BOMA/Chicago Smart Grid Initiative. After dinner, Kohl commenced the ‘State of the Membership’ address with a speech that highlighted BOMA/Chicago’s focus on advancing market recovery through innovation, technology and adaptability. Over the past year, BOMA/Chicago launched a new website in conjunction with migrating to a new database system to accommodate growing membership needs. This website fosters member engagement though a customized Member Center and features a 24/7 self-service functionality with quick and easy access to the information our members need. Kohl also told our members about how BOMA/Chicago was selected as one of three BOMA local associations to pilot a new industry designation and certificate program from BOMI International, the High-Performance Sustainability Program. In total, we offered over 70 different educational programs this year to industry professionals from entry-level through senior management. T.J. Brookover, Vice President of BOMA/Chicago and Chairperson of the Energy & Sustainability Committee, then took center stage to discuss the remarkable progress we made on the BOMA/Chicago Smart Grid Initiative. BOMA/Chicago reached two key milestones this year – (1) Through the newly formed BOMA Chicago Energy Center LLC, we selected Automated Logic Corporation as the technology partner and Project Performance Group as our project manager for the Initiative and (2) We began the installation of smart meters, data management system software and related hardware at three pilot buildings – 125 South Wacker Drive, 550 West Washington and 330 North Wabash Avenue, all three of which are expected to be generating real-time electricity usage data before year-end. Brookover encouraged member buildings to complete the Smart Grid Expression of Interest Form to learn more about how they can enroll in the program and start achieving significant energy cost savings. Log into the BOMA/Chicago website and click here to access the Smart Grid Expression of Interest Form. Bob Quast, BOMA/Chicago Treasurer, speaks about union contract negotiations and BOMA/Chicago’s financial stability. BOMA/Chicago Treasurer and Chairperson of the Labor Committee, Bob Quast, gave a report on the financial stability of BOMA/Chicago and labor relations efforts. In 2013, building and affiliate membership remained strong, with a current membership roster of 262 buildings, a slight increase from last year, and 164 affiliate members. Quast stated that in order to prepare for advocacy challenges we will face in 2014, the Board of Directors approved a straight increase in membership dues of 1.5%. This is the first dues increase since 2011. BOMA/Chicago also successfully negotiated a new three-year contract with the Service Employees International Union (SEIU) Local 1 earlier this year. This contract will run from April 22, 2013 through April 24, 2016 and covers security professionals employed at BOMA/Chicago member buildings. Overall, Quast enthusiastically reported that BOMA/Chicago is in excellent financial condition and that he is proud to represent the only BOMA local association that offers collective bargaining benefits and representation in grievance hearings at no-cost to our buildings. Michael Cornicelli concluded the leadership presentation with a passionate speech about the successful advocacy efforts of BOMA/Chicago in 2013 including: (1) Working with state legislators to ensure that building owners and managers retained the right to determine concealed carry policies for their own buildings and (2) leading a consortium of local real estate organizations aligned with the City of Chicago in which we defeated the attempt of the State Fire Marshal to require the costly installation of fire sprinklers in all high-rise buildings. Cornicelli also discussed our stance on bicycle ordinances and the Divvy bike program. In a speech that ended with a standing ovation, Cornicelli made it clear that BOMA/Chicago will forbid policy advocates who lack commercial real estate experience from passing laws that negatively impact our buildings and disregard private property rights. We want you all to know that BOMA/Chicago is prepared to both lead and support you in building a stronger commercial real estate market in Chicago. Members of BOMA/Chicago are the backbone of this industry. Your continued participation in our advocacy efforts, our educational programs and networking events is vital and we appreciate your continued support. BOMA/Chicago would also like to congratulate George Kohl on his new position as the Chief Operating Officer at Sterling Bay. Kohl began working at Sterling Bay earlier this week where he will oversee management and leasing of the firm’s three million square foot portfolio. Click here to read the fully story on George’s move and to learn more about his work history. As the year comes to an end, all of us here at BOMA/Chicago find ourselves “oooo’ing” and “ahhh’ing” not only at our skyline, but also at all of the accomplishments of our members. We see all of the work, energy and passion you put into your buildings and businesses every day and we are proud to represent you and the amazing metropolis of Chicago. 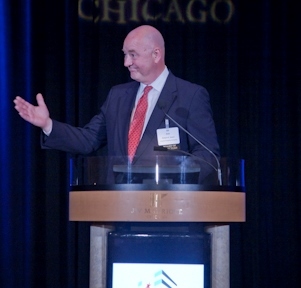 This entry was posted in BOMA/Chicago Events, Chicago CRE Industry, Chicago News, Continuing Education, CRE Trends, Property Management, Tenant Relations and tagged 111th Annual Membership Meeting, 125 South Wacker Drive, 2013 Annual Meeting, 2013 Annual Report, 330 North Wabash Avenue, 550 West Washington, Able Services, Annual Meeting, Automated Logic Corporation, bicycle ordinance, Board of Directors, Bob Quast, Bob Six, BOMA Chicago Energy Center LLC, BOMA/Chicago Foundation, BOMA/Chicago Smart Grid Initiative, Chuck Wagener, Comcast Business, Concierge Unlimited International, Corporate Concierge Services, Derrick Johnson, Divvy bike program, Economic Impact Study, Eurest Services, fire sprinklers, George Kohl, High-Performance Sustainability Program, JW Marriott, Michael Cornicelli, November 21, Project Performance Group, real-time electricity usage data, SEIU Local 1, Service Employees International Union Local 1, State Fire Marshal, state of the membership address, Sterling Bay, T.J. Brookover, Zeller Realty Group. Bookmark the permalink.